Tomorrow is May 1st. Do you know what that means? Well around here it is Derby Day, but that’s not really my cup of tea. 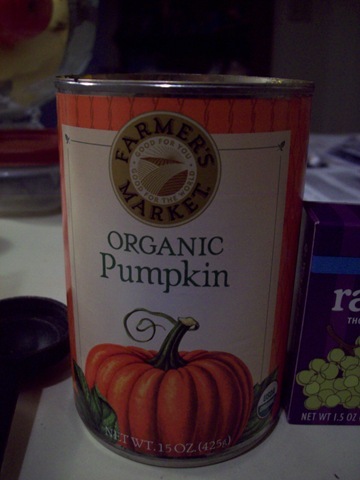 Instead, I will be celebrating the first of the month by beginning the Happy Herbivore 30 Whole Days blogger challenge. So, what’s the challenge? 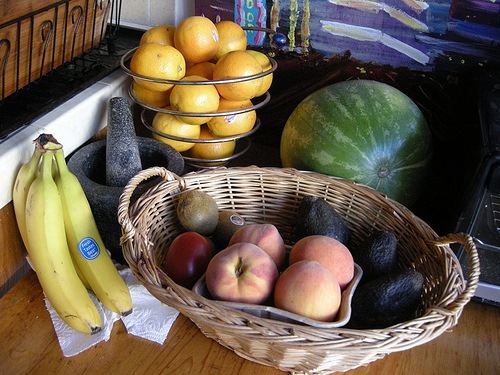 Eat no processed foods for 30 days! Why would I want to do this challenge? I like to think that I eat pretty “whole” already but there are still things that make their way into my pantry or freezer that are processed, like a frozen dinner here or a can of soup there. These will be easy to avoid. But the real challenge is going to be the foods I didn’t even think of as being processed — like tofu, sweetened soy milk, and peanut butter that contains more than just peanuts! I think it is important for all of us to reduce our intake of processed foods as much as possible. Even if they are “healthy” they still often contain added sugars, salt, and other additives that we just don’t need. I also plan to take this opportunity to finally kick some nasty habits that keep creeping back into my life (diet soda, sugarless gum, etc). 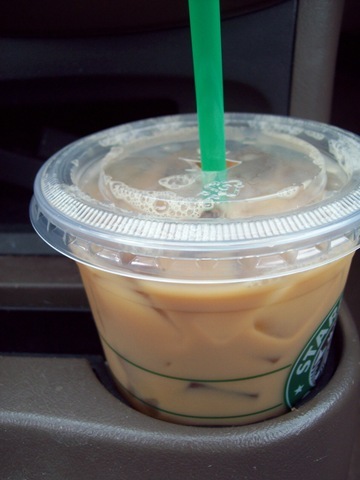 Perhaps I’ll even try to cut back on that second cup of coffee. I also have a few parties to go to for graduations, weddings, and whatnot. The good thing about parties though is there are usually fruit and vegetable trays and I can make and bring a dish or two. I’m also going to exclude Wednesday night potluck dinners from the challenge because my girls have been accommodating enough since I went vegan in October, I don’t want to put any more pressure on them. 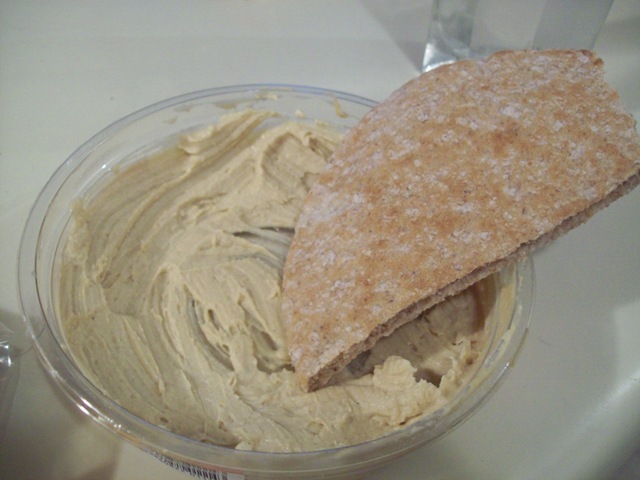 I can make adjustments on my own, like skipping the bread or bringing fruit for dessert. As the HH says herself, “the goal is not to make this so extreme it becomes impossible.” So I will just be doing the best that I can and hopefully learning a lot in the process (ha, no pun intended). If you want to know more or are interested in joining this challenge yourself, check out this blog post or go directly to our Google Group and get ready! As soon as a big race is over, I’m always left wondering what my next challenge will be. For the past 16 weeks, I have been mostly focused on training for the mini marathon and now I have a little down time to do some different things and run a bunch of really fun 5K races! But what else will I do next? Today, I did a challenging 15 minute incline walk on the treadmill, one set of a full body workout with weights, and some ab exercises. I usually do 25 reps of each ab move but today I noticed they were much stronger, so I went up to 35. That’s the key to keep exercises working for you — either increase the weight, the reps, or change the moves completely! I’ve been thinking of doing a 30 day ab challenge this summer. It is the most neglected area of my body and yet it is so vital to all the things I do, whether it’s sitting at my desk at work or running mini marathons…I need a strong core! In addition, Josh admitted that he is not really using his gym membership. While I am sad that he’s not been going, you can only lead a horse to water. And we both agreed that someone should get use out of it, so we are having it transferred into my name! I’m also toying with the idea of running the Louisville Half Marathon in October. But I have a little time to decide. I figure if I do register for it, I will have to start training in July. So we’ll see! What are your fitness goals for the summer? After the mini marathon on Saturday, I took three days of complete rest in order to recover, physically and mentally from the race. I’ve also been getting attacked by allergies since Monday but it has also helped me focus on properly recovering. However, I was quite exhausted in general! So it was a welcome rest period. By yesterday afternoon though, I was ready to get moving again! But I didn’t want to overdo it, so I did a short loop around the campus and lots of stretching afterwards. It was like giving myself a nice, gentle “Welcome back!” run. 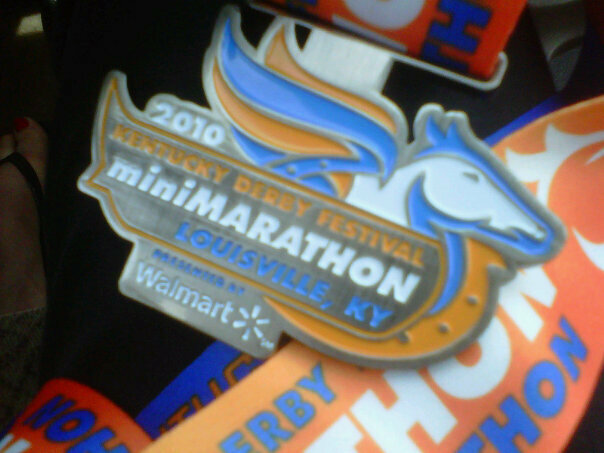 I remember in 2008, the first time I ran the Kentucky Derby Festival mini-Marathon, I took 2 weeks off from running because I had become burned out. Then I half-heartedly trained for a 5K at the end of May before giving up running totally for a while after that. We’re talking months. It took me what seems like forever to get back to this point, so I’m sure as heck not giving it up now! What is your typical rest period after a long race? Remember the Pound for Pound Challenge? I almost didn’t. Between my slight mental breakdown, subsequent recovery and then illness/allergies, I managed not to post about the weigh-ins and my thoughts on the challenge for the past two weeks. Guess I had other things on my mind? Last time we “met” I had decided to give up calorie counting for a while and focus on choosing wholesome nutritious foods and eating intuitively. This choice was even more liberating than the last few times I’ve made it. I think it might actually stick this time too. Speaking of stress, during Week 9, I was in the midst of a stress meltdown. But, even though I took a step back from blogging, I did not hide away and drown my sorrows in food. I also took a step back from exercise even though it was a week before my half marathon. Sometimes getting your mental state back on track is more important! No, it always is. But, during that following week, I had another major breakthrough. I finally admitted to myself (and others) that I do not handle stress well at all. Even if my mind tries to deny it or “fake it”, my body pays the price. I have to get control of what stresses me and do more to relieve myself when stress does come up to that uncomfortable level. I kept my focus on healthy eating, easy exercise, relaxing hot baths and putting my trust back in God. I remembered what is good about my life and what I can do to change the things I’m not so happy with. I remembered that I’m only human and it is okay to break down sometimes. In fact, I think it might just be the best thing that could’ve happened. I’ve learned more about myself the past few weeks than I have in a long time. I finished my school work early so I could focus on the race and nothing else. And I didn’t stress about my race either because I knew I was going to have fun, no matter what. And I did! With 9 weeks to go, I have absolutely no idea what will happen. In 10 weeks, I have a net loss of 2.6 lbs. So in the next 9, I could lose another 2.6, or 1.6, 0 or 10. But you know what? It doesn’t really matter! I’m not giving up on the challenge, in fact I’m still very inspired to keep going toward my goal. But I am NOT going to put myself under pressure. I am not going to stress about it. Because I don’t know if you’ve noticed, but when I’m under pressure and stressed, NOTHING goes well. I can’t live that way anymore. I think I am finally starting to feel better! I think it helps that the rain is finally clearing out of here for a couple of days and thus my allergies are letting up. 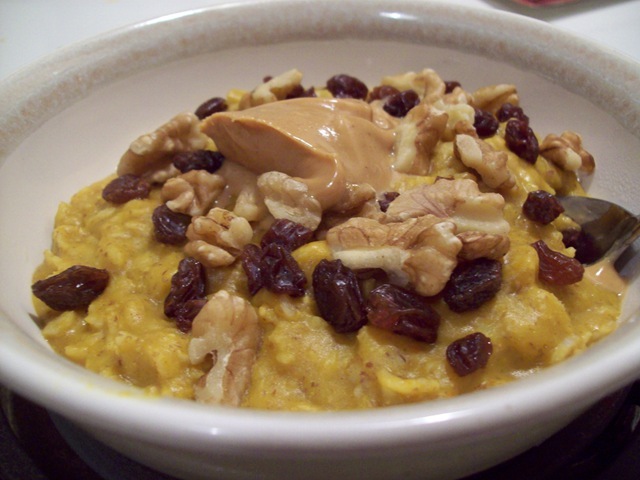 Breakfast this morning was a beautiful creation…I am so in oats mode right now, at least until it warms up again! 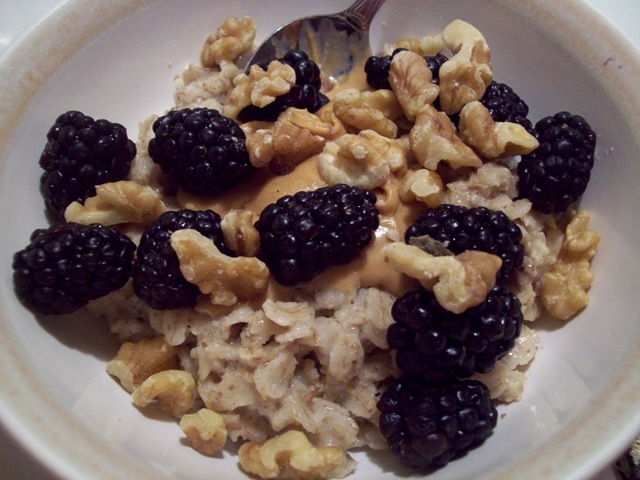 This bowl contained 1/2 cup oats cooked with 1/2 cup almond milk and 1/2 cup water, 1 tbsp flax, and topped with blackberries, walnuts and peanut butter. 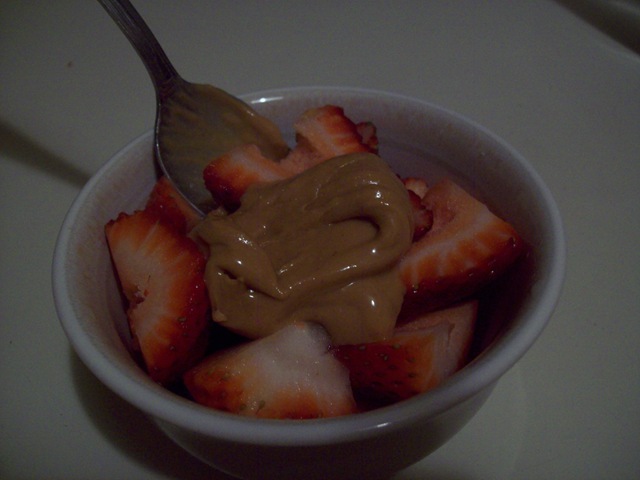 I recently went back to more “natural” peanut butter (only ingredient peanuts) and it’s so tasty! 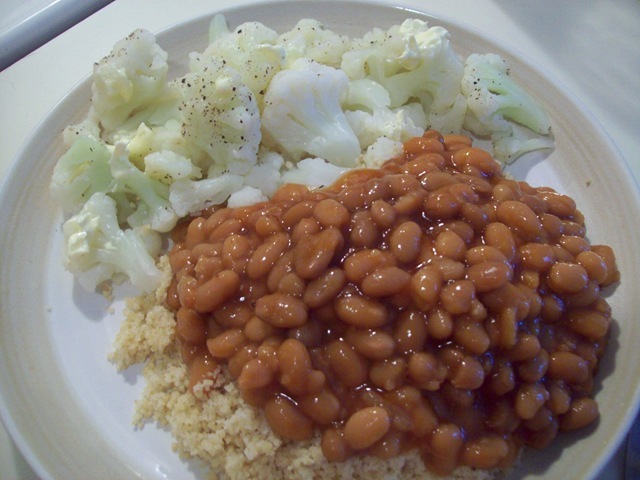 For lunch, I was really craving some more vegetarian baked beans (they are so good, must be the brown sugar, ha ha) which I had today with cauliflower and couscous. My hair is awesome, will have to take pics later! 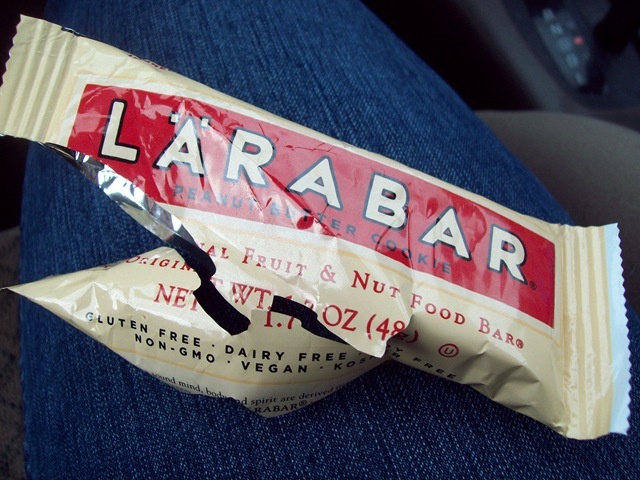 While I was out, I snacked on a peanut butter cookie Larabar and an iced coffee with soymilk. 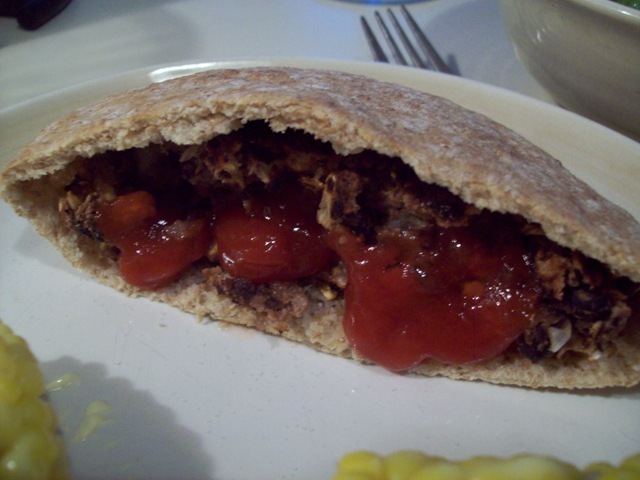 A few hours later, I made Mama Pea’s black bean burgers for dinner. It had been a while, they are so good! 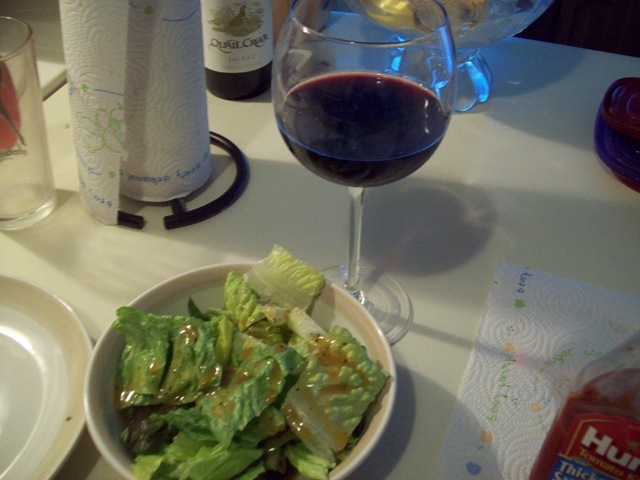 I started off with a romaine salad and shiraz. Perhaps I spoke too soon? My nose is all stopped up and I keep sneezing! But my energy is back, so I know I can function normally again. I keep forgetting I did a mini marathon four days ago! I usually prefer to use Libby’s brand, but I’ve had a hard time finding it so I picked this up at Whole Foods instead. 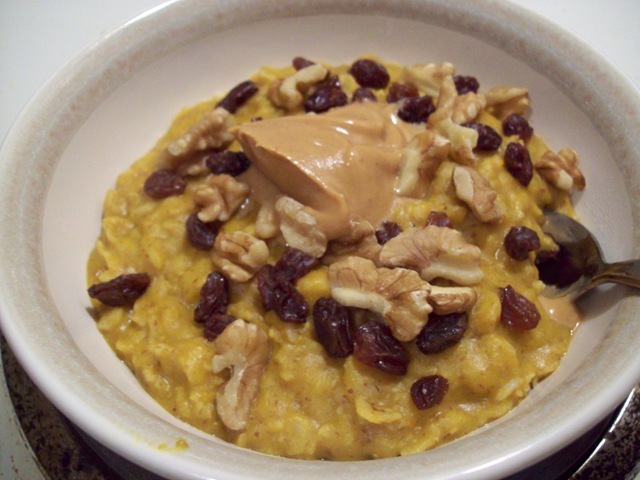 This bowl contained 1/2 cup oats cooked with 1/2 cup water and 1/2 cup almond milk, 1/2 cup pumpkin stirred in, pumpkin pie spice, 1 tbsp flax, and topped with raisins, walnuts and all natural peanut butter. I still felt bad so I decided to stay home from work and slept until after 11 a.m.! I must have needed it. 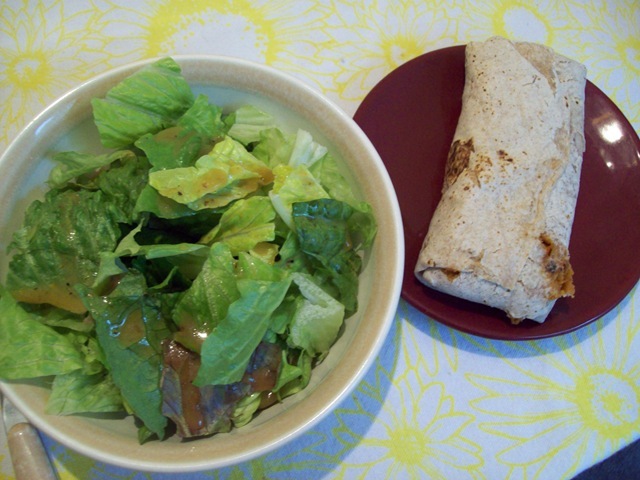 For lunch, I had an Amy’s non-dairy burrito and a romaine salad with vinaigrette. I hadn’t had an Amy’s burrito in a while and it was really good! I must be fighting off an illness because my appetite has been insane today! 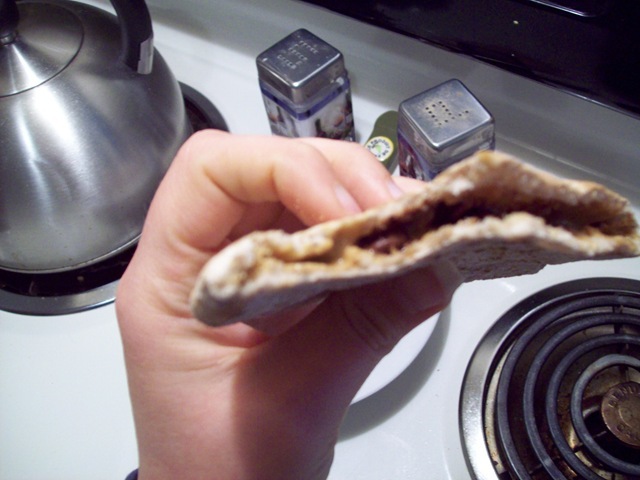 After lunch, I had a pita pocket with peanut butter and chocolate chips. 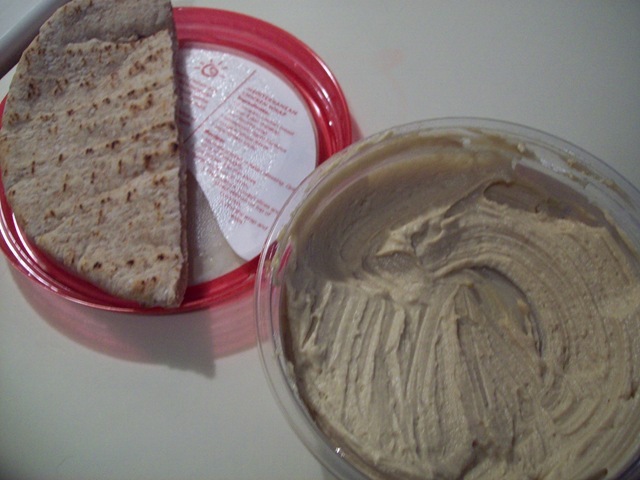 Then I took another nap on the couch with the dog and woke up REALLY hungry again, so I had another pita pocket with some hummus. 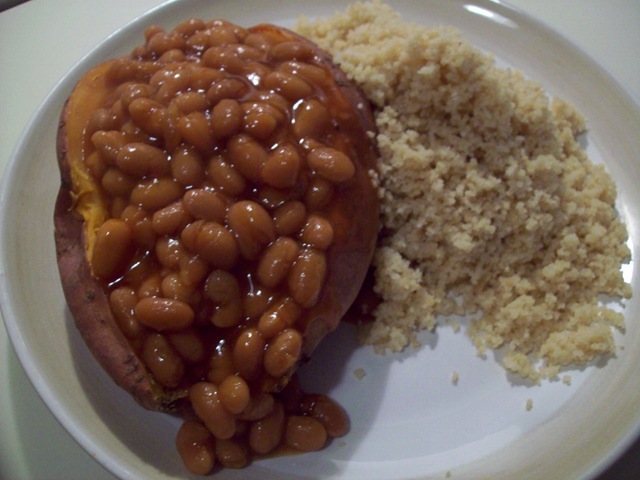 When it came time for dinner, I had only one thing on my mind…baked beans on a sweet potato! Then afterwards, I started to think about dessert. 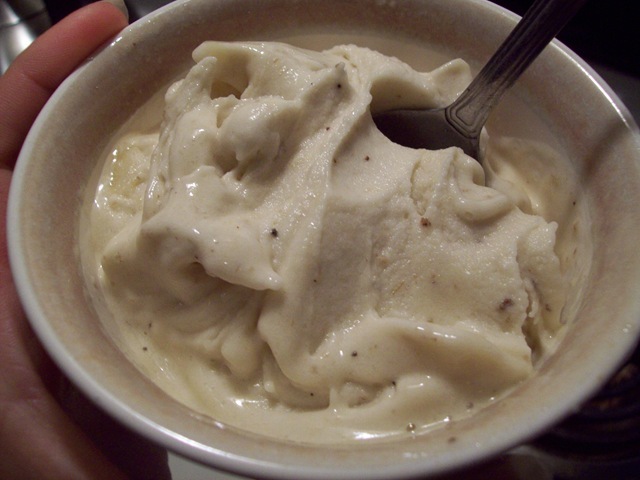 I finished off the chocolate chips earlier in the day but remembered the many frozen bananas that resided in my freezer! I’m still not feeling so great and think I will head to bed early. I’m hoping it’s just allergies and the crazy weekend I had that just ran me down a bit. Hopefully, some rest will help and I can get back to work tomorrow! I’ve tried quite a few new products this past week, thanks to a Whole Foods gift card, so I figured it’s high time I share them with you all! 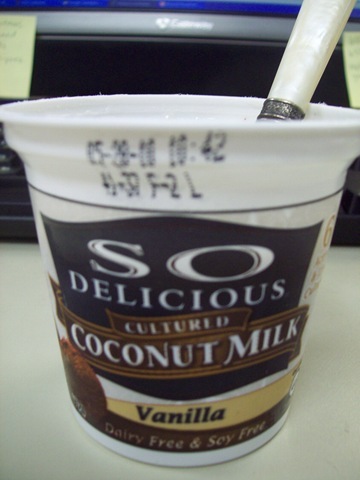 I had been eye the So Delicious coconut milk yogurt for months but it was always too expensive for me. Since I had a gift card and it was on sale (for $1.50, gasp!) I went ahead and picked up a couple. While I did appreciate that it wasn’t as sweet as normal non-dairy yogurts, I have to say it just didn’t do it for me. But I have another flavor to try later, so we’ll see! 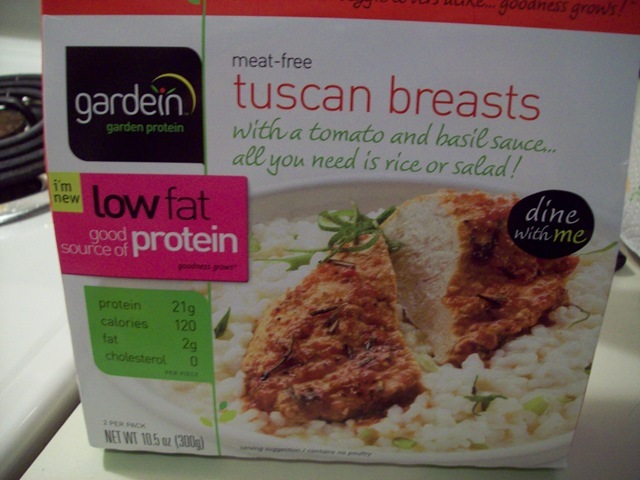 I had been hearing such good things about Gardein from some other vegan bloggers, so I was thrilled to find one of their products on sale as well. I try not to use “faux meat” products too often but this one had an ingredients list I was very comfortable with: all things I was familiar with and could pronounce! This tasted great! 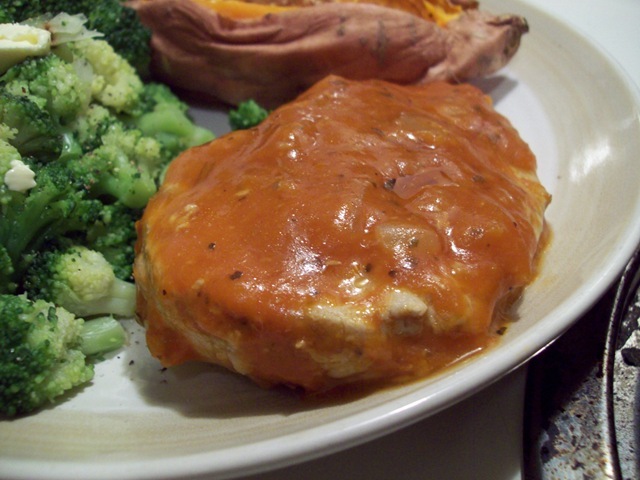 And believe it or not, even though it’s what some people might be looking for, this did not taste like chicken to me and I was happy with that. I was also happy with the 21 grams of protein and no sugar! 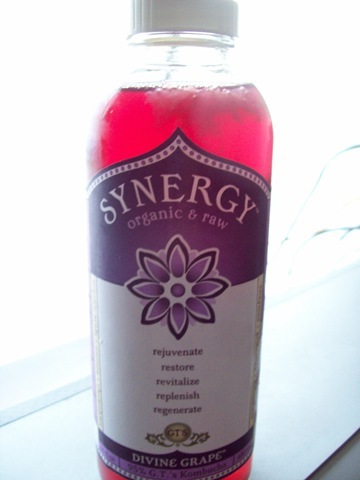 Finally, I tried some kombucha, which I have heard you either love or you hate. I will admit that it sounds disgusting and the vinegary smell is a bit unsettling at first, but I thought this particular “flavor” (grape) tasted great! I was not as impressed with the Mystic Mango flavor, which surprised me since I love mango of everything else! But I guess it’s hit or miss when you are dealing with fermented, raw tea, no? On Sunday morning, I like to make a special breakfast for myself, which usually means something like pancakes, waffles or French toast. This Sunday was no exception! 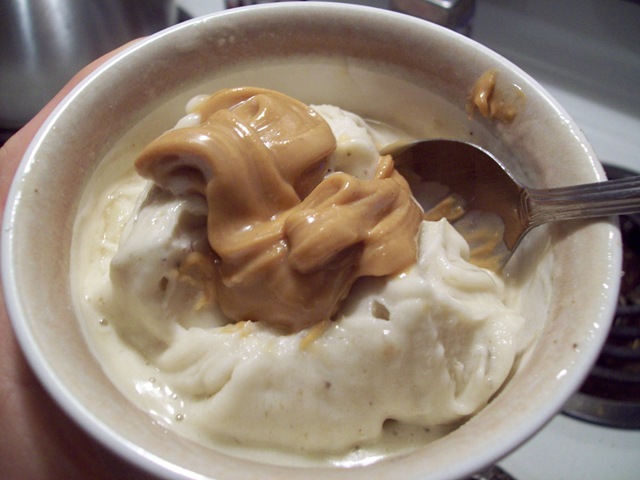 Believe it or not, I somehow managed to let myself run out of peanut butter (don’t worry, I have more now) so I had to work with what ingredients I had on hand. What occurred was an amazing breakfast! I used 1/4 + 1/8 cup of Hodgson Mill’s Buckwheat pancake mix. I added 1 tsp Ener-G egg replacer, 1/2 tbsp extra virgin olive oil, and 1/4 cup + a splash of unsweetened rice milk and combined. I also smashed half a banana and put it in the pancake mix. 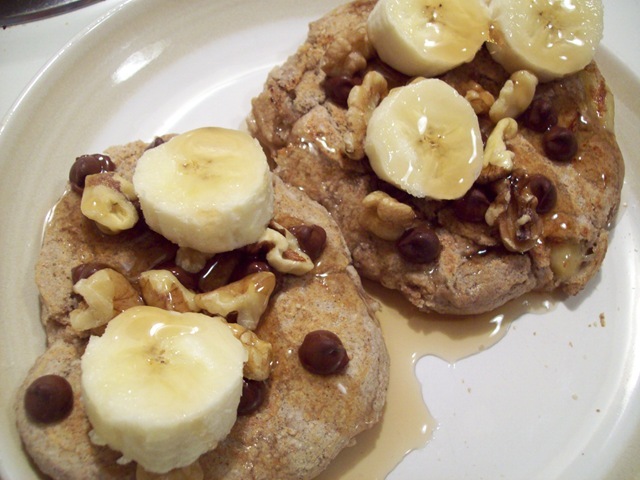 I cooked them over medium heat until they were done and then topped them with chocolate chips, walnuts, the other half of the banana and syrup. 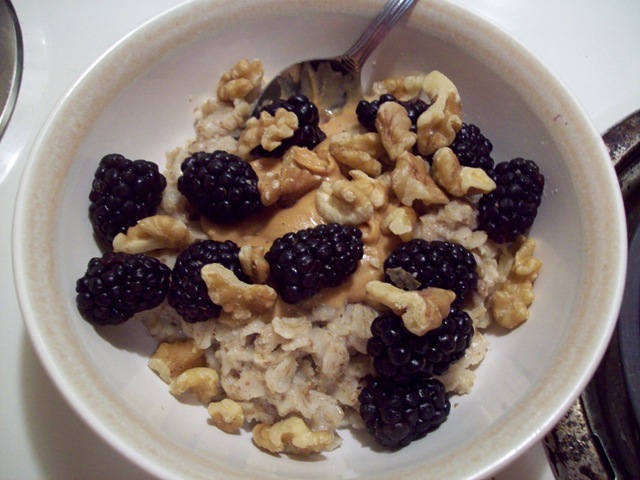 Even without peanut butter, this breakfast made my day! Do you like to make a “special” breakfast on the weekends? As you might’ve heard, I finished a half marathon on Saturday! Usually before races like these, people load up on spaghetti, bread, and lots of other carb-filled meals. But for me personally, I don’t go that route. In fact, if I ate pasta and lots of bread before a race, I would be miserable! Pasta and refined grain bread makes me feel really bloated and icky. But I still know how to “carbo load” just in my own way. I ate oatmeal for breakfast every day last week and enjoyed brown rice and whole wheat couscous with dinner a few times. 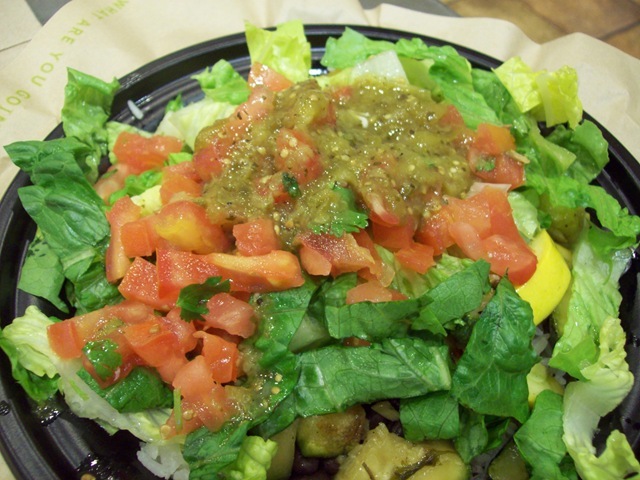 The night before the race, Courtney and I went to Qdoba, just like we did before the 10-miler a few weeks ago. 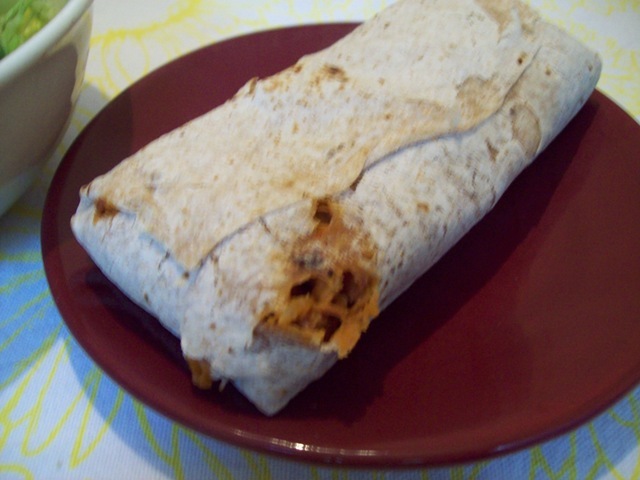 This time, instead of a burrito, I got a “naked” grilled veggie burrito and added lettuce, pico de gallo and medium salsa. 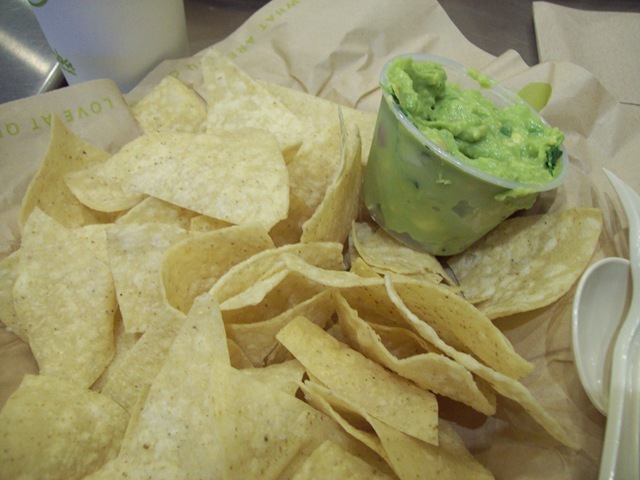 And I enjoyed some tortilla chips and the best guacamole ever made! And believe it or not, I wasn’t able to finish everything! It felt good to fill up on yummy food but still listen to my body and know when to stop. If you are a runner, tri-athlete, etc. 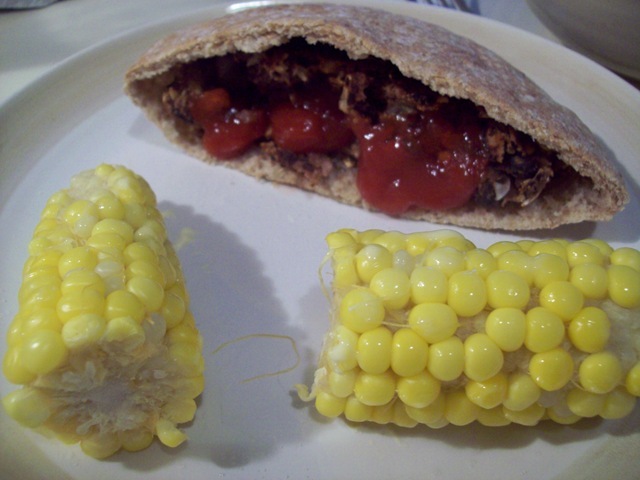 what is your typical pre-race dinner? Wow, I can’t believe another mini-marathon has come and gone. It’s also amazing to me how incredibly different each one of these races has been — this was my third in a row! Saturday morning, I woke up at 5 a.m. 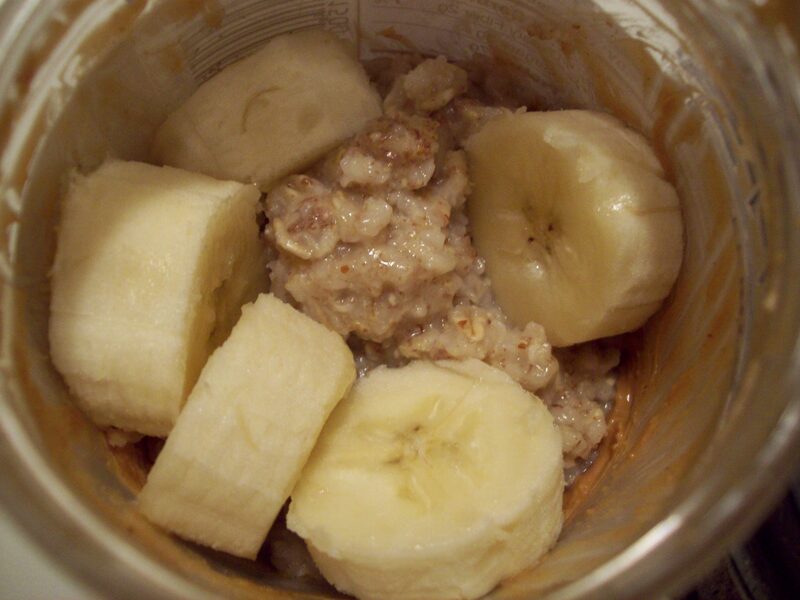 I ate some oatmeal with banana and peanut butter right out of the jar! I decided to skip coffee and in hindsight I wish I’d had some but it was so early and I really didn’t have time to make any before I had to meet Farrah at the parking lot! We stood in line for a shuttle to the starting line and got rained on the whole time! 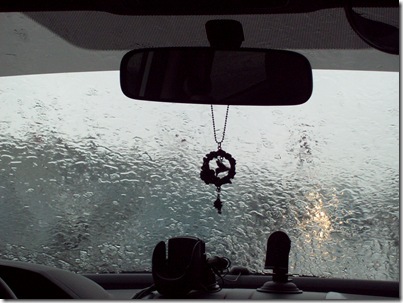 But thankfully, we got to the race in plenty of time and it stopped raining before it started. It was a good 10-12 minutes before we actually got across the start line but once we did, all my pre-race nerves went away – I feel like an old pro now. The first few miles were a breeze. We did one easy flat mile and then the next couple were through hilly Iroquois Park. The hills did not bother me as much as they had during the 10 miler. Once we got out of the park, we had to stop at the bathroom, which unfortunately took several minutes due to there only being a few and a long line ahead of us! Once we got going again, it had started to rain a bit but it felt good because I was quite warm. Farrah and Chloe ran ahead of me and then took walking breaks, which allowed me to catch up with them.One thing that really bugged me about this race were the lack of mile markers. The only ones I remember were 1, 7, and 10. The rest of the time, I had no idea what was going on. During the race, I alternated between water and Powerade. I usually skip the sugary stuff but something told me to do it this time. Do you use sports drinks? After the first 6 miles (I think), I started taking walking breaks for a minute or so. I didn’t wear a watch so I wasn’t sure of the ratio. But the longer the race went on, the more I walked. When we ran into Churchill Downs, we had finished 7 miles and at this point it was so hard for me to believe that we had 6 more miles to go! When we split from the marathon runners, around mile 9 or 10, we made another pit stop at the bathrooms. In my mind, I felt like I could jog some more but my legs were hurting and my left hip felt like it was on fire. So despite my best efforts, I ended up walking the last 3-4 miles of the race. But during this time I got to know a really sweet girl named Chloe. She’s a young, single mom working two jobs AND going to college and following her dreams. In her short years, she has lived a lifetime already and yet she’s so confident in herself and so grateful for her blessings. And it was her first mini marathon! She had just started running earlier this year. The last mile or so of the race was totally ridiculous. They changed the course this year and all the turns made me feel like we had just gone in a big circle. But once we rounded the corner and saw the finish line, we all took off running. It felt so good to finish strong! Now I can relax a bit, decide what I want to focus on now, and keep on running for fun! I’ve got quite a few 5k’s coming up in the next couple of months, so I’m thinking a PR might happen at some point. We’ll see!